Today is Friday, April 26, 2019. Your local time is 02:50pm. According to CNN and PC WORLD, HistoryKill is a "Top Internet Privacy Tool!" Click "Run" or "Open" to download and Install HistoryKill. STEP 1) Click "More Info" link on left side of the blue box. 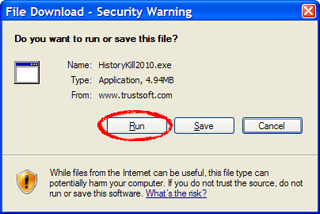 STEP 2) Click the "Run Anyway" button to Install HistoryKill.